New data show that health spending over the past several years has been normalizing toward the rate of general inflation, rather than growing higher and higher, as had been the case almost continuously since the 1970s. This moderation in the growth rate of spending predates the national recession. And it puts the lie to the claim that we need government to put the brakes on an "out-of-control" health-care system. 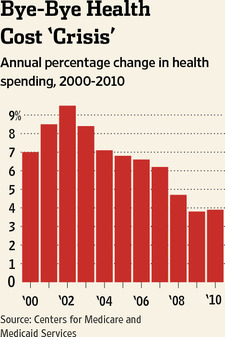 As the graph nearby shows, the growth rate of national health expenditures, according to data compiled by the Centers for Medicare and Medicaid Services, has been moderating since 2002. The moderation has been driven by cumulative improvements in medical care and by insurers, and by marketplace disciplines on the demand for medical care. Consumers are finally getting more involved in managing and paying for their own care. Contrary to the perennial doomsaying, the health-care system is--almost in spite of itself--getting better. A generation of breakthrough drugs for chronic disease, mental illness, HIV and cancer were developed in the 1980s and '90s at great cost. Dozens of these drugs--like Zocor for heart disease or Zyprexa for schizophrenia--are now widely available, many in generic form. There are now countless electronic ways of telling patients about them. And health insurers are driven by their own evolving market disciplines to make sure patients start taking them and keep taking them in the cheapest available versions. Combine all these new medicines, information channels and business compulsions with the slow, steady transfer of economic responsibility for health care--from corporate and government bureaucrats to consumers and their families--and suddenly health-care starts to look almost like an actual market. Much of this change got off the ground around 2001 as managed care (i.e., the hated "HMOs") gave way to a renewed era of unlimited consumer choice and access--for a price. Those with insurance were suddenly free again to choose whatever health care they wanted, but this time with their own money. Higher deductibles, new co-payments, Health Savings Accounts, "tiered" drug plans--these were all rolling out between 2000 and 2004, the same years that health-care inflation was starting to cool. Suddenly, a $5 generic drug might work just as well as a $50 branded one. People concluded that going "out of network" for an extra $100 out of their own pocket might not be worth it. It turned out that a nurse practitioner in an urgent care clinic can spot an ear infection for $30 a whole lot faster than an emergency-room physician can for $1,000. There were many new drugs available, many others going generic and some, such as Tagamet for ulcers and Claritin for allergies, even going over the counter. Doubtlessly, the Administration will take credit for the slowing of the rate of increase in healthcare spending, despite its start under Bush, and despite Obamacare mostly not yet in effect. Answer: "It's the competition, stupid, not the mandate." Taiwan has a good health care system. Why don't we?